I was one of the thousands of people who experienced a crisis comms plan first hand when my taps stopped running on Saturday evening. This is my story. My Streatham flat was among more than 20,000 London homes affected after the thaw in the snowy weather caused burst water mains and leaks over the weekend - a problem repeated in patches across the country. Several senior politicians waded into the issue (no pun intended), and, significantly, water regulator Ofwat pointed the finger at water firms. Rachel Fletcher, chief executive of Ofwat, gave this damning assessment: "Water companies have been warned time and again that they need to be better at planning ahead to deal with these sorts of situations, including proactively communicating with customers when they anticipate issues." So how well did Thames Water, my supplier, communicate with those who were hit? The first problem was the absence of any information (that I could see, at least) about the situation on Thames Water’s website on Sunday morning. The lack of response on the customer helpline also didn’t help. I tried calling twice; to be fair, someone did answer the second time, but no information was available and I was advised to look at social media instead. With the mercury in my forehead slowly rising, the work-focused part of my brain was reminded of the importance of comms and customer service working together when crisis hits. (The rest of my brain just wanted a flipping shower.) And what about the many people who don't use social media? In the sober light of day, the tweets from Thames Water were fairly predictable, focusing mostly on giving basic information. 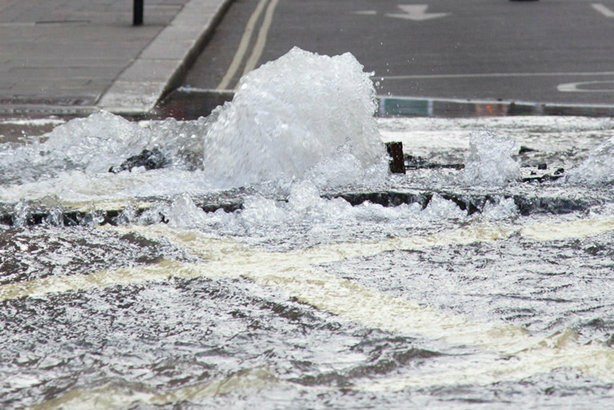 Our customers in #NW2, #NW3, #NW5, #NW11, #N2, #N6, #N10, #N19 have been experiencing no water and low pressures since yesterday caused by a large number of leaks in the area which we are working to fix. We have detection teams in the area to locate and repair them. We’re aware of no water or low pressure issues in #SE22, #SE26, #SE27, #SE21, #SE23, #SW2 area. We’re sorry for the disruption. We’re investigating the issue and will do everything we can to get things back to normal as soon as possible. But it is noticeable how messages can land differently when the crisis affects you directly. While it’s admirable and understandable that Thames Water would want to praise its engineers for working overtime to solve the problem, to an irate homeowner with no water, it felt like this was not the time. (Much like how United Airlines stood by its employees during the passenger removal crisis last year). In fact, posts like this felt like a diversion from the question on everyone’s lips: when will the bloody water be back? Even otherwise innocuous expressions seemed to stir the ire of those affected. Did Thames Water have to say it was "pleased" to have delivered bottled water to a site in the south of Streatham? Especially as, for me and many others, the location was two bus rides away. Do you really expect me to travel 2 miles without a car and with a 3 years old child to get some water. You should give an alternative supply of water but something reasonable. It's your responsibility to make sure that alternative supply reach people's home. There was also a backlash after Thames Water urged those whose supply had returned to only use water for essential purposes. None of the tweets from Thames Water were terrible, in my view. Some were quite effective. And maybe there is nothing that could be said to satisfy customers in such a fraught situation. But the episode shows how the importance of nuanced language and presentation is magnified during a crisis situation. Or that’s my view at the moment. I may feel differently after water returns to my flat again. Whenever that may be*. * My taps are still not flowing at the time of writing, although I’m told they will be soon. I’ve still not had a shower, but hope to have done so in time for the Power Book launch party on Tuesday evening. Best not to get too close, just in case.